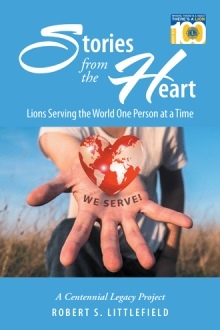 To all of you who have been watching and patiently waiting for a new post on my blog, I am so pleased to report that Stories from the Heart: Lions Serving the World One Person at a Time is now available from Club Supplies at Lions Clubs International (lionsclubs.org). My personal centennial legacy project began in 2011 when I started collecting stories and comments from Lions around the world. My goal was to complete the book and get it published during the final year of the 100th anniversary celebration of Lions Clubs International in 2017-2018. As December 2017 came to a close, the book was published by AuthorHouse (Bloomington, Indiana), and now it is available for those interested in reading it. This is a book about the “stories from the heart” of those who have dedicated themselves to a life of service. The stories relay how volunteering to serve the vulnerable and those in need transforms the lives of those who dedicate themselves to helping others. The book also creates a greater appreciation for the role that helping others can have on an individual’s sense of purpose. Through the stories and comments included in this book, you can gain a better understanding of what service to others has meant to those who have chosen to heed the call to give of themselves in order to make life better for those in need. The 187-page book begins with an introduction explaining how the project got started. Chapter 2 follows with a look at how service through Lionism evolved through the first 100 years of the association. In Chapter 3, the reasons motivating people to serve are identified. This is followed in Chapter 4 by reasons that sustain an individual’s commitment to serve over time, as well as how volunteers use their own stories to motivate others to serve. A unique and special part of the book is a collection of 100 stories recorded in Chapter 5–symbolically one for each of the 100 years celebrated at the centennial–coming from around the world. These stories reveal the epiphany moments when the storytellers knew in their hearts that they would always be committed to serving the needs of others. Chapter 6 explores how volunteers confirm their commitment to service and offers additional insight into the value of being in a Lions Club. Finally, the epilogue looks forward in time and offers takeaways for the reader explaining why Lionism will always exist as long as people are committed to serving the needs of others. The book is written in such a way that Lions and non-Lions can appreciate the content for what it represents. The history of service through Lionism has changed the course of history in the world. Knowing about how that happened is both informative and inspirational. Staff from Lions Clubs International and Lions Clubs International Foundation are exploring ways to make this book available to a wide sampling of Lions and non-Lions around the world. Plans are underway to schedule a public talk and to hold a book signing at the International Convention in Las Vegas in June. I’ll bring my pens and hope to run out of ink! The book is available from several vendors. The ISBN is 978-1-5462-1951-1. If you want to purchase the book through Lions Clubs International, copy the link below and paste it into your browser. The cost is $23.99 plus shipping. If you order through the Club Supplies website, $13.85 from the sale of each book will be donated to Lions Clubs International Foundation. All royalties will be donated to LCIF. The book is also available at authorhouse.com, amazon.com, and barnes&noble.com. Search by book title and author name. However, the largest donation to LCIF per book will be made through the Club Supplies website so please consider ordering through LCI. There are many people and entities to acknowledge for their personal and financial support of this project. First and foremost, I must thank the hundreds of Lions from around the world who shared their personal stories. In addition to their stories, they shared their perspectives about what motivated them to serve, kept them serving, and how they recruited others to service. I had over 900 stories–many more than I could include–and I am in debt to everyone for their willingness to reveal something they had held in their hearts. Lions Clubs International–particularly Dane LaJoye–deserves great credit for authorizing and providing the necessary resources to move forward through the research and publication process. There are others who are credited in the book–particularly Jade Monroe (graduate student at North Dakota State University) and Emily Knapp (graduate student at University of Central Florida) who provided assistance with data collection and management, as well as coding and some general research—but I must finally and most importantly thank my wife, Lion Kathy, who made it possible for me to have the time to write, who read every word from a reader’s viewpoint, and offered helpful and constructive suggestions, as well as encouragement, along the way. If you purchase a copy of the book, you can make a difference in the lives of people through the great work of the Lions Clubs International Foundation–celebrating its 50th anniversary in 2018–and the Lions who serve around the world. I hope you enjoy reading this book written from my heart. I hope you are having a nice visit with the Farringtons! All my best to you and Kathy! See you in Vegas, Baby!! !